Mayor Madeline Rogero will participate in the second U.S.-China Climate-Smart/Low-Carbon Cities Summit next week in Beijing, where mayors from the two countries will demonstrate commitment to climate action and share experiences in building low-carbon, climate-resilient communities with U.S. and Chinese state and local government, private sector, and civil society leaders. All attending leaders are already engaged in strong city-to-city collaboration through initiatives such as the Compact of Mayors and the Alliance of Peaking Pioneer Cities (APPC). The Summit will be held June 7 and 8 at the Beijing International Hotel Convention Center. “When nations across the world committed to climate action through the Paris Agreement in December 2015, our city had already demonstrated leadership and progress in planning for a low-carbon future,” Mayor Rogero said. “The United States and China are the two largest contributors to carbon emissions globally, but we are also coming together to work toward solutions to climate change. Our work as cities will help enable both countries to meet the ambitious climate targets announced by President Obama and President Xi in November 2015 and to meet the Paris Agreement climate goals. 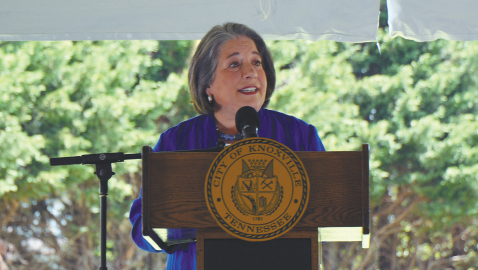 Mayor Rogero’s invitation from the White House to participate in the summit follows the City of Knoxville’s commitment to local climate action here in Knoxville as well as a strong commitment by the Compact of Mayors, a global coalition of over 500 mayors and city officials pledging to reduce local greenhouse gas emissions, enhance resilience to climate change, and track progress transparently. Erin Gill, Director of the City’s Office of Sustainability, will also attend to participate in Summit proceedings. For mayors and their staff, the cost of airfare and lodging while attending the U.S.-China Climate-Smart/Low-Carbon Cities Summit will be covered by C40 Cities, an organization supporting international city efforts to address climate change. Currently, 3.9 billion people live in cities, representing 54 percent of the world’s population. Cities, as hubs of fossil fuel-based economic activity, emit more than 70 percent of global energy-related greenhouse gas (GHG) emissions. Yet, 70 percent of cities are already dealing with the effects of climate change, and nearly all are at risk. By taking decisive actions to reduce local emissions, cities across the world are positioned to make dramatic impacts toward reducing global climate change.